God’s love is manifested in sending his son Jesus to our poor conditions in the darkness of sin. The light of Jesus shined in this gloom. Those who accept the light of Jesus are redeemed and those who reject him remain in the darkness of the world by selecting their own condemnation. Those who were bitten by fiery snakes in the desert were saved by looking at the bronze serpent on a pole lifted by Moses. Jesus the redeemer was lifted in glory on a cross followed by his resurrection so that humanity could look at him with faith and be saved. Let us shine in the world with our truthful life after the model of Jesus who came as the light of the world. (14) And just as Moses lifted up the serpent in the desert, so must the Son of Man be lifted up, (15) so that everyone who believes in him may have eternal life.” (16) For God so loved the world that he gave his only Son, so that everyone who believes in him might not perish but might have eternal life. (17) For God did not send his Son into the world to condemn the world, but that the world might be saved through him. (18) Whoever believes in him will not be condemned, but whoever does not believe has already been condemned, because he has not believed in the name of the only Son of God. (19) And this is the verdict, that the light came into the world, but people preferred darkness to light, because their works were evil. (20) For everyone who does wicked things hates the light and does not come toward the light, so that his works might not be exposed. (21) But whoever lives the truth comes to the light, so that his works may be clearly seen as done in God. This gospel passage is the second part of the discussion of Jesus with Nicodemus, a Pharisee and a wealthy member of the Sanhedrin. He was sure that Jesus was from God because “no one can do these signs that you are doing unless God is with him.” (John 3: 2). He came to discuss with Jesus at night to be free from public notice. The darkness of that night was also symbolic of his spiritual darkness and he was seeking light from the creator of light. We notice the support of Nicodemus in the life of Jesus in two instances in the gospel of John. In John 7: 50-51, Nicodemus reminded the Sanhedrin that based on the Jewish law they could not “condemn a person before it first hears him and finds out what he is doing?” (John 7:51). Nicodemus provided spices for embalming the body of Jesus and assisted Joseph of Arimathea for the burial of Jesus. (John 19:39–42). This refers to Numbers 21:9 where Moses mounted a serpent upon a pole. The Greek word for "lifted" means "highly exalted." John, who gives importance to the glory of Jesus, presents Jesus as predicting that he would later be exalted on the cross for our healing followed by his resurrection and ascension. God had delivered the sinners of the Old Testament from death caused by snake bite by looking at the bronze serpent as mark of their faith in God’s word. So also, those who believe in the Word made flesh and lifted on the cross would be saved from the bite of the devil (serpent). The Israelites had been wandering in the desert for 40 years since they left Egypt. It took such a long time because of their sins. Many had died in the desert. They had no immediate hope of entering the promised land because they were denied passage through the land of Edom. Though they were close to the promised land, Moses was leading the people in the opposite direction to travel around the land of Edom. That made the people upset.They again complained against Moses and God for lack of food and water and the quality of food they got by the grace of God. In response, God punished them by sending fiery serpents. The snakes were called “fiery” because the bite by these snakes caused great fever and inflammation leading to death. Some other interpreters guess that these snakes had the color of fire. People asked Moses to intercede for them to God to take away the serpents. Instead of eliminating the serpents, God asked Moses to make an image of the fiery serpent made of bronze and raise it on a pole so that it could be seen from all parts of the camp. Whoever bitten by snake was asked to look at the bronze snake and their life was saved from death. God, who had denied making any image, had ordered to create the image of a fiery serpent on a pole as a foreshadow of the crucified Jesus in the future. Looking at the bronze serpent did not mean to worship it but to remember their sin like the original sin committed by Eve at the temptation of the serpent and ask God’s mercy. It was not the bronze serpent that saved them but God who asked to look at it to remember God. However, the bronze serpent later became an object of worship. People were burning incense to it during the time of Hezekiah. So, the king destroyed it to regain proper worship of the Lord. (2 Kings 18:4). Instead of the pole and bronze serpent of the Old Testament, now we have the cross and the body of Jesus on the cross to look at with faith and repentance for our salvation. 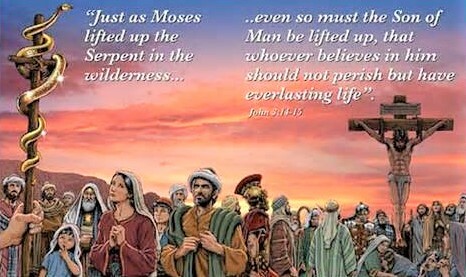 The fact that there was a bronze serpent raised on a pole by Moses was not enough for saving the lives of the people. Those who were bitten by snake had to look at it with repentance and seeking mercy of God rather than relying on medical remedies of the time. The death of Jesus on the cross brought us salvation. However, we need to look at him with faith for our redemption. The cross of Jesus was also the way to the glory of Jesus. Our sufferings for Christ and his church also will lead us to partake in the glory of Jesus. The bronze serpent was free from poison. So also, Jesus raised on the cross was free from sin. (15) so that everyone who believes in him may have eternal life. God's love and Son’s redemption are offered to all. It acceptance is limited to those who believe in him only. Belief is an ongoing trust and should continue throughout our life. Our faith in Jesus involves belief in what Jesus teaches and our trust in the person of Jesus. Our obedience to the Word of God and our imitation of Jesus are required from us. The Greek term "eternal life" (zoē) referred to quality and quantity of life after death. In John zoē refers to resurrection, eschatological life, or the life of God Himself. Unlike Synoptic Gospels, John’s gospel emphasizes the "eternal life" as the goal of his Gospel. (16) For God so loved the world that he gave his only Son, so that everyone who believes in him might not perish but might have eternal life. God’s love for humanity was not well understood by the people of the Old Testament. According to their understanding, God imposed laws upon them and punished severely those who violated them. They saw God as one demanding sacrifices and offerings. Though God offered them many favors during the history of Israel, still they were afraid of God and they did not appreciate God as their benevolent Father. Only through the incarnation, good deeds, teachings, suffering, death and resurrection of Jesus that people came to understand and appreciate the love of God. Israelites had a misconception that God who made covenant with them was theirs and his redemption was not for others. However, John the Evangelist presents God who loves all humanity and the world that He created for the humans. It was to save all the world that God sent his son. The incarnation of Jesus was the supreme gift of God to humanity. It started with God the Father who sent his son Jesus. The gift of Jesus to us was gaining the lost life of eternal bliss of first parents and their descendants through his passion, death, and resurrection. Through these, God showed His love in action. "Only begotten Son" means "unique or one of a kind." Though all people are children of God, there is no child of God like Jesus. (17) For God did not send his Son into the world to condemn the world, but that the world might be saved through him. Jesus came with a mission of salvation. The Greek word for “condemn” means both judgment and condemnation. God never condemns people. They take it for themselves by turning away from God like the prodigal son. Jesus came for our rescue to which we need to cooperate for our salvation. Judas preferred wealth to Jesus. Choice was his and not of God. People have the opportunity and freedom to come to the light of Jesus or to remain in the darkness of the world. We select our reward or condemnation. (18) Whoever believes in him will not be condemned, but whoever does not believe has already been condemned, because he has not believed in the name of the only Son of God. Faith in Jesus will deliver us from the condemnation that we had inherited by the fall of mankind. Those who deny God have selected their condemnation. A father always wants the redemption and not the destruction of his child. God does not send people to hell. They themselves choose it. (19) And this is the verdict, that the light came into the world, but people preferred darkness to light, because their works were evil. Judgment of condemnation or salvation is established by our acceptance or rejection of Jesus. It will be finally completed in the last judgement. (John 5:29). Creation started with the formation of light on the first day (Genesis 1:3) before the creation of sources of light like sun, moon, and stars on the fourth day. (Genesis 1:14-19). The original source of light in the world was God. That light came into the world again in Jesus who said, “I am the light of the world” (John 8:12). The evil doers who preferred darkness rejected this light. Even during the public ministry of Jesus, some “elite” people who were eyewitness of the acts of glory of Jesus rejected him. They found justifications for their stand and accused Jesus of blasphemy. (20) For everyone who does wicked things hates the light and does not come toward the light, so that his works might not be exposed. Adam and Eve wanted to hide from God soon after they committed sin. Judas and the soldiers of the Temple came to arrest Jesus in the darkness so that they could avoid the exposure to the crowd who usually gather around Jesus. Thief usually steals at night so that his action will not be exposed. Criminals hide after their crime. (21) But whoever lives the truth comes to the light, so that his works may be clearly seen as done in God. Jesus who said: “I am the way and the truth and the life” (John 14:6) is the model for those who live the truth. We find the truth of the Kingdom of God through Jesus. In him we have a new life and he leads us to the truth. When we live according to the truth manifested by Jesus we come to the light of God. In the sermon on the mount Jesus taught: “your light might shine before others, that they may see your good deeds and glorify your heavenly Father.” St. Paul reminded Thessalonians: “since we are of the day, let us be sober, putting on the breastplate of faith and love and the helmet that is hope for salvation.” (I Thess. 5:8). 1. Crucifix (cross with corpse) and cross are not just symbols of Christianity. Like Moses lifted bronze serpent on a pole to which people looked with faith in God and saved from snake bite, we look at the passion, death and resurrection of Jesus with faith for our salvation. Imitating Jesus’s way to glory is our selection of eternal life. 2. A follower of Jesus is exposed in the light of Christ. Our actions will have their impact in the community in giving witness to Jesus. The exemplary life of the early Christian community was the reason for the rapid growth of the church at that time. (Acts 2: 47). 3. Nicodemus who came at night to discuss and learn from Jesus later helped Jesus in his trial and burial. He was one of the three rich people in Jerusalem at his time. However, he could find meaning of life only in Jesus. Let us value Jesus and his ways than the riches of this world.